I have no idea whether Zootopia — the latest animated fantasy from Disney — will become a classic, but I do know that it scores high on the fun meter. So three cheers for a story about Judy Hopps (voice by Ginnifer Goodwin), a bunny who aspires to become a cop in the city of Zootopia. Police work has been Judy’s ambition since she was a child. Primed for action and a do-gooder’s career, Judy wants to leave the countryside and her family of underachieving carrot farmers. When Judy arrives in the city, she becomes the first bunny on the Zootopia PD. An unimpressed chief Bogo (Idris Elba), arbitrarily decides that Judy’s fit only for parking duty. He doesn’t believe a bunny can hold her own on Zootopia’s mean streets, hardly a surprising opinion from a water buffalo. Zootopia is unique because the animals all get along. That’s why it’s called Zootopia. Predators and prey may not be the best of friends, but the former have learned to refrain from devouring the latter. 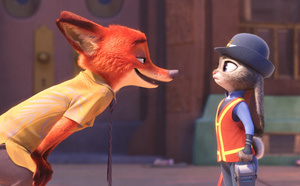 While handing out parking tickets, Judy meets Nick Wilde (Jason Bateman), a conniving con artist of a fox who eventually teams with Judy to help crack a case involving the disappearance of 15 mammals. If Judy can solve the mystery, she’ll get herself off parking duty, maintain a position on the force and climb out of Chief Bogo’s (you’ll pardon the expression) dog house. Judy and Nick make an odd couple as they learn some shocking news: Some predators suddenly are turning on prey, thereby threatening Zootopia’s peaceable social structure. Disney loads up on animals and voices, but I particularly enjoyed an arctic shrew mobster who’ll remind adults in the audience of Don Corleone. Mr. Big, as he’s called, is brought to gravelly voiced life by Maurice LaMarche. Appropriately, I suppose, the Zootopia’s DMV is staffed by sloths, a joke that surely will appeal to every adult who’s ever endured what seems like an interminable wait at any department of motor vehicles. The story evolves into a light-hearted police procedural that winds up preaching a lesson about acceptance and free will — if that’s not too grandiose a term for the fact that the animal characters are forced to decide whether to be ruled by instinct or choice. Directors Byron Howard, Rich Moore and Jared Bush do a fine job of keeping Zootopia amusing for kids and equally enjoyable for the adults who accompany them to theaters. Disney’s animators seem to have had a grand time creating Zootopia — which consists of districts such as Tundratown, Little Rodentia and Bunnyburrow. OK, that’s a bit theme-parkish, but dividing Zootopia into distinct environments must have kept the animators from getting bored. It also gives Judy and Nick an opportunity to venture into Zootopia’s bad neighborhoods. At various times Judy must prove to herself and the world that she’s no dumb bunny; the same goes for this frolic of a movie. The highest compliment I can pay Zootopia? It’s no dumb bunny, either.